"Nissan engineers insist the GT-R really does only have 480hp. 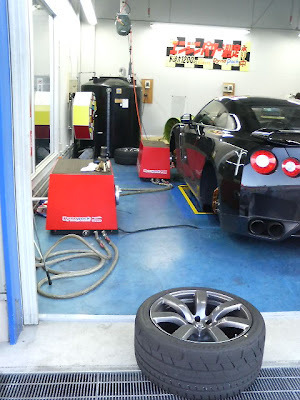 Motohiro Matsumura, president of Nissan Technical Center North America, Inc. in Farmington Hills, Michigan, says our dyno test story which revealed the GT-R develops 430hp at the wheels is basically right. But he insists our estimate of a minimum 15 percent friction losses -- which suggests the GT-R is making 507hp -- is wrong. Matsumura-san says ultra-low friction bearings in the wheel hubs and transmission, plus the careful alignment of the all-wheel drive system's propshafts, mean friction losses are reduced to an unprecedented 10 percent or so. We're going to get a GT-R back and conduct some coast-down tests to see if he's right." Its funny how much Nissan tries to deny the horsepower of the car. The hard line is we beat the other cars with technology, not horsepower.